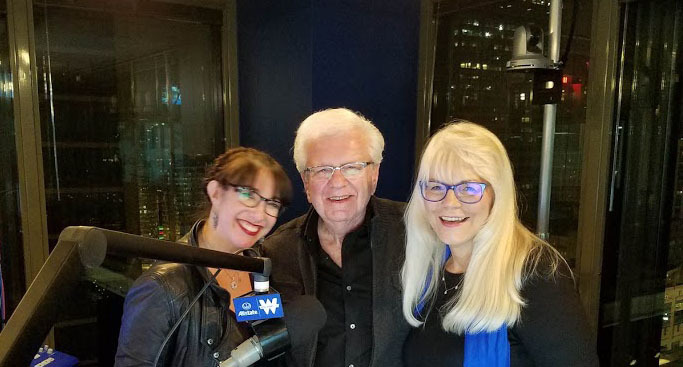 After spending the past month on Florida’s Panhandle, we arrived back in Chicago on Tuesday just in time to take the turkeys out of the freezer for our Thanksgiving Day show and while we were at WGN radio preparing our birds, we got to catch up with Patti Vasquez. That’s always a good thing. Patti Vasquez and Steve & Johnnie at WGN radio. For those of you who, for whatever reason, don’t feel the need to follow our every move, we should clarify that, once again, we’ll be playing the part of your friendly, local Thanksgiving turkeys as we jump back inside your radio speakers to gobble up the airwaves from Noon-3PM this Thanksgiving Day on WGN. We’ll talk with an old friend, Mike Himebaugh, of Hello Dave, about a rare reunion of the group for FarmRaiser2018. This is a VERY cool event coming up at Joe’s on Weed St that will benefit The Farm Way. This entry was posted in Appearances, Events, Holidays, Hurricane Michael, WGN and tagged All-Star Guitar Night, FarmRaiser2018, Gulf Coast State College, Hello Dave, Jason Hedden, Johnnie Putman, Life After Dark, Mike Himebaugh, Muriel Anderson, Panama City, Panama City Beach, Panama City News Herald, Patrick Crispen, Patti Vasquez, Steve & Johnnie, Steve and Johnnie, Steve King, Survivors Anthology, The Farm Way, Tony Simmons, WGN, WGN AM, WGN Radio. Bookmark the permalink. 2 Responses to We’re “Home” for Thanksgiving on WGN! Oh NO, I missed it. Do you have a podcast? Not to worry. The podcast hasn’t been posted yet, but when it is we’ll post a link.